Step Three: Nominate other blogs for the award, create 11 questions for them, and tell them they been nominated. 1. What’s your favorite song and why? 2. Where is your favorite vacation destination and why? Traveling is one of my most favorite things in the world! So, I can’t pick just one place. I’ve walked the cobblestone streets of Italy, got stranded by myself in France, camped in the chaparral deserts of Baja, Mexico overlooking the ocean, hiked in the Rocky Mountains, won big in Vegas, drank wine in Napa Valley, traveled to see my favorite bands play live, drank Red Stripe beer on the beaches of Jamaica, watched the fog roll in in the Great Smokey Mountains, found a whole sand dollar on the beach in Florida, almost fell of a mountain in Arizona, and watched the river turn green on Saint Patrick’s Day in Chicago and too many other incredible experiences to list! My parents instilled in me this love of adventure. As a kid, we traveled across the country in our Winnebago, checking out small towns, big cities, mountains, and deserts. My parents taught me that the journey counts just as much, if not more, than the destination. I can’t wait to introduce Jax to the adventures of traveling! 3. What is your earliest childhood memory? I remember getting stuck inside the toy box! 4. If you had an invisible cloak for one day where would you go, what would you do and why? Huh. Good question! I would go check out the restricted parts of the Sistine Chapel. I’d also bring surprise gifts to people who are sick in the hospital to lift their spirits. It’s no secret I love to eat good food. My last meal would be a little bit of everything: mom’s jerk chicken, kalbi wraps from Sunda in Chicago, my dad’s camping eggs, a Coor’s Light beer, biscuits and gravy, a glass of pinot noir, sausage, McDonalds french fries, and a piece of Ghirardelli Milk and Caramel chocolate. 6. If a Genie could grant you 3 wishes what would they be and why? You can’t wish for more wishes, that’s cheating! I would wish for my mom to be alive. Then she could teach me how to raise my son. I would wish for my father-in-law to be alive. Then he could teach Jax how to fish and hunt and fix things. I would wish for enough money to pay for what we needed with out having to be stressed out about it! I started writing on CarePages to keep our family and friends updated after Jax was born. After he came home, I wanted an easier and better way to keep everyone updated and so An Early Start was born! 8. Do you believe in soul mates? Yes. My husband is my soul mate. Yes and no. It bothers me when people say this as a filler when they can’t think of anything else to say during a difficult situation. 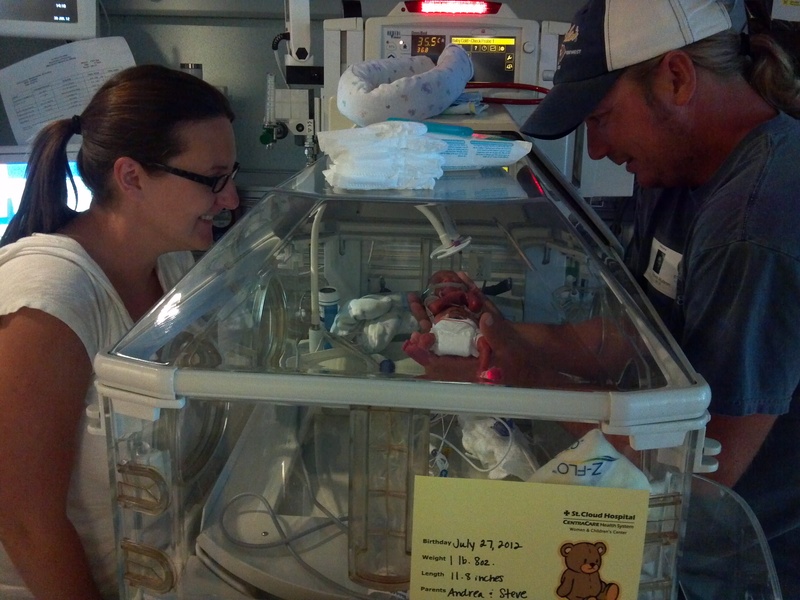 It was often the very last thing I wanted to hear while Jax was in the NICU – I mean – what possible reason could there have been for my body failing my child and him having to fight so hard to live? That being said, I think perspective is the most important part of this statement. I mean, if it gives hope to think that something bad happened for a good reason, then I think people should hang on to that hope. Generally, I’ve found that most of the bad things in my life have indeed had “good” consequences later on down the road. 10. If you could change one thing about yourself what would it be and why? I’m much too anxious a person. I’m also too responsible – I never let myself play until all my chores are done. Herein lies the biggest problem with me being a stay-at-home-mom: my chores are never done. It add an extra element of anxiety that I’m trying hard to manage. I wish I could let go of responsibility sometimes! 11. If you were stuck on a Desert Island and could only take one thing what would it be and why? I’ve lived back in Minnesota for the same amount of time that I lived in California (7 years). My house is 95 years old and was built by my uncle’s grandparents. Our house is haunted. (We’ve seen at least 4 different spirits and have had a medium come to help us get rid of them.) Now you all can call me crazy, if you want! I love hosting parties – nothing makes me happier than having all my friends and family hanging out having fun together! I talk to my plants because I think it helps them grow better. I love walking and when the weather is nice I walk in the woods at least a few miles a day. Jax teaches me something new every single day. I hate snow and cold weather but I live in a state where winter lasts 5 months out of the year. Seeing live music is one of my favorite things to do and I can’t wait to take Jax to more music festivals this summer. I love reading fantasy and science-fiction type books because they help me escape for a little while. If you’d like to accept this nomination, here are your questions. Tell me about your favorite concert. If you’ve never been to a concert, what is your favorite song? Tell me about your favorite hobby. What is something you’ve always wanted to try but haven’t yet? If you went back in time, is there one particular thing you would do differently? I look forward to seeing who accepts this nomination and reading the posts! Thanks for the heads up, Lorraine! Done. I’m really missing out, I have never been to see any live music. No concert, no festival. Oh dear. Also Dire Straits were my Mums favourite too. And I think it I were granted some wishes I would certainly choose the same as you and bring my dear mum back.